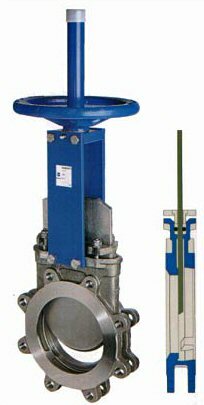 The ORBINOX Series 10 Knife Gate Valve was primarily designed for use in the pulp & paper industry, water management, waste-water management, chemical, power, steel plants and O.E.M. It’s design includes a mono block cast body, wafer style, raised face seat with gate guides and jams for positive seating. Available in sizes ranging from 2″ through 72″. Standard body materials are cast-iron with a 304/ss gate, other materials available include stainless steel, 254SMO, etc. This valve is available in metal and resilient seated versions with standard or V-port orifice. The series 10 face to face complies to TAPPI standard TIS 405-8 and MSS SP81. It’s operating temperature extends to +1000oF. The series 10 can also be outfitted with actuation options including handwheel (standard), lever handle operator, bevel gear, chainwheel, electric actuator, pneumatic actuator, hydraulic actuators, and fail close actuators. 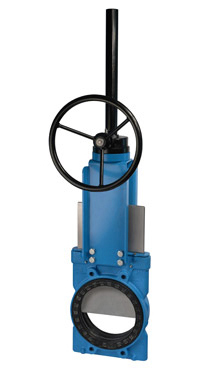 The ORBINOX Series 20 Knife Gate Valve is a high-performance knife gate valve. 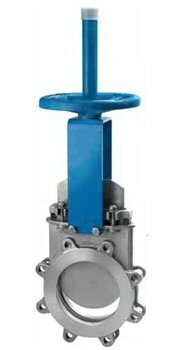 This knife gate valve is very suitable for use in the pulp & paper industry, chemical industry, power management, steel plants, and O.E.M. The standard series 20 comes in an all 316/ss, including 316/ss body, 316/ss gate, and 316/ss stem, other materials include 254SMO, 317L ss, etc. Available in sizes from 2″ through 72″ this valve can fill the requirements of any size application. It’s design features a mono block cast body, raised face seat with gate guides and jams for positive seating. It is available in metal and resilient seat models with a full array of resilient seat materials available, including EPDM (standard), poly tetra flora ethylene (PTFE), and Viton® for the oil industry. The face to face complies with TAPPI standard TIS 405-8 and MSS SP81, and is a full lug style. The series 20 comes standard with a handwheel operator but can be easily outfitted with chainwheels, levers, bevel gears, electric actuators, pneumatic actuators, hydraulic actuators, and fail safe systems. BODY: One piece integrally cast stainless steel body with reinforced ribs in larger diameters for extra body strength. Internal cast guides allows for tighter shutoff. Port design according to MSS-SP-81 and Tappi TIS 405-8. Internal design avoids any build up of solids that could prevent valve from closing. GATE: Standard AISI 316 stainless steel gate. Gates polished and lapped for a greater seal between the gate and both the packing and seat. SEAT: (resilient) Retained in the valve body internal groove by its trapezoidal shape. Standard EPDM; also available in different materials such as Viton, nitrile, etc. PACKING: Standard braided PTFE impregnated fibre with EPDM o-ring for better shut off, with an easy access packing gland ensuring a tight seal Long-life braided packing is available in a wide range of materials. STEM: The standard stainless steel stem offers a long corrosion resistant life. For rising stem handwheel actuators only, a stem protector is provided for additional protection against dust while the valve is in the open position. ACTUATORS: All actuators supplied by ORBINOX are interchangeable, and supplied with an standard mounting kit to allow for installation on site. YOKE or ACTUATOR SUPPORT: Made of EPOXY coated steel (stainless steel available on request). Compact design makes it extremely robust even under the most severe conditions. EPOXY COATING: The epoxy coating on all ORBINOX cast iron and carbon steel valve bodies and components is electrostatically applied making them corrosion resistant with a high quality finished surface. The ORBINOX standard colour is RAL-5015 blue. The body is ductile iron (EN GJS400, ASTM A 395), and the gate AISI 304 2”-16” / DUPLEX 2205 18”-24”. The seat features replaceable rubber sleeves in natural rubber or EPDM. Flanges are PN10, PN16, or ANSI150.